Description: NA-2 heading north at Moore's Crossing in Bedford. Description: NA-2 heading north past Merrimack station. 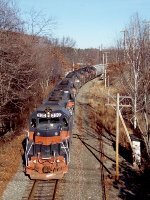 Description: NA-2 approaching CPN-21 northbound to Manchester at Merrimack. Description: POED arriving into E Deerfield Yard. The Conn River Loop branches left. Under the nose of 376 was the switch to the Turners Falls Branch. In 2019, 376 & 643 are gone. Description: Guilfords train POSE (Portland ME to Selkirk NY) with 5 engines at Ayer MA. Description: Lots of power required to handle those big New York hills and valleys. Description: Four GP40's power a train through the Cumberland side of Falmouth. Description: MEC 353 heads up a train through North Yarmouth. Description: A member of the crew throws the switch at Auburn. 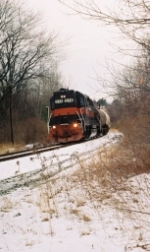 The train is headed for Danville Junction. Description: A high-nosed GP40 leads a train toward Danville Junction. Description: A train heads for New Gloucester after passing through Danville Junction. Description: MEC 376 departs signal territory at Auburn. Description: MEC 376 leaves signal territory at Auburn. Description: MEC 376 and train roll toward Depot Road. Description: A freight train climbs upgrade as it crosses Blackstrap Road. Title: WASE across Essex St. Description: HLCX 6221 - HLCX 6404 - MEC 510 - MEC 376 detach from B&M 334 at Rigby Yard. The first four units mentioned were the power for POSE. Description: Fourth engine on RUED. Description: Brunswick Extra with MEC 374 - MEC 376 crosses Stanwood St. in Brunswick. They will head light up the Lewiston Lower Branch to Grimmel's to retrieve ten loads of scrap. Title: Brunswick Extra 376 at River Rd. Description: Brunswick Extra with MEC 376 - MEC 374 struggles upgrade as it prepares to cross River Rd. in Topsham with ten loads of scrap from Grimmel's. Description: An eastbound road freight waits to be re-crewed in front of the old tower. Description: MEC 313 the lastest(As of 2/18/10) Waterville repaint sits in Westford awaiting a recrew. Description: AY-7 working the east leg of the wye before heading east at Ayer, MA.